Calling all Merdeka babies! If you're born in August this is your month! Lai lai we belanje your meal! A treat for ya 🎈Bring 3 friends and the birthday 👶🏻 gets a Burger + Side + Bottomless Soda on us! 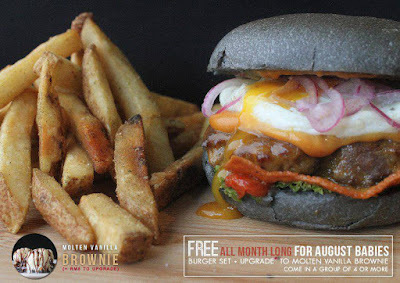 So, come along in a group of 4 or more and the birthday boy/girl gets a complimentary single patty burger (set) of their choice and ADD RM 8 to get a Molten Vanilla Brownie! Boleh share share with everyone. Deal is valid once a day but unlimited times per month. Show us your IC/passport pls! Applies to Seapark, Sunway, OUG and Cyberjaya.